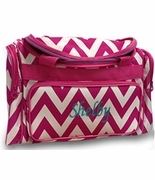 Always a favorite, perfect for the toddler, personalized duffle bag. 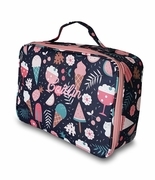 Great for for camping, sleepovers and trips to grandpas. Includes embroidered name. Cute and fun applique dinosaur duffle for books, cars, trucks or snacks. Boys personalized duffle bag measures 15�W x 13�H x 8� across bottom. Cotton quilted fabric with zip closure.